I learned to sew before I learned to knit. At first I tried handsewing with my mom and grandmother. When I was nine, my mom decided I was ready to give the sewing machine a go. Brilliantly, she handed me over to our teenage babysitter Robin C. who lived across the street from us. Both Robin and her sister Ellen sewed beautifully and although my mother was a wonderful seamstress herself, she knew it would be much easier if someone else, not her, taught me to sew. And besides, we Nicholas Girls idolized those Cashen Girls. My first project was an a-line mini-floral print dress with a lilac faux tab front and a zipper in the back. I wore that dress in my 4th grade picture and mostly likely until I couldn't squeeze into it anymore. So what, you ask, does this have anything to do with steeks? If you haven't guessed by now, I went on to have a long sewing career making most of my clothes through my teen years and beyond. When I eventually learned to knit proficiently, I was in college majoring in Textiles and Clothing. Knitting was something I picked up for fun. I could do it on the train or the bus going back and forth to college. Eventually my interest in knitting began to take over my sewing hobby. I started spinning wool. And then I had all this yarn which I couldn't find a pattern for. A professor of mine wisely recommended some books including Elizabeth Zimmerman's Knitting Without Tears. I started designing my own patterns for my own handspun yarns following the sage advice of the wonderful EZ. I noticed the word steek but I was into "knit in the round" sweaters. A year or so later, I picked up a book called Knitting in the Nordic Tradition and saw the steek technique again. I decided to give it a go and haven't turned back since. I knit most of my sweaters in the round and cut them and sew the sleeves in. I'm not afraid and you should not be either. When I was working on Kristin Knits and I got to the section on sweaters, I thought long and hard about "knitting in the round" vs. "knitting back and forth." I have written patterns both ways. When I worked for TYC, I always wrote my patterns for back and forth knitting. We didn't feel our shopowner customers were interested in "steeking." We were afraid we would turn them off to certain knit in the round and steeked patterns and then sit with a warehouse full of them. We realized the LYS-owners didn't have a lot of extra time in their day and wouldn't want to be bothered with helping their customers learn about and make and finish steeks. But my book was my own thing. I could do whatever I wanted, within reason. I asked a lot of knitting friends what they thought. I asked some shopowners. I was torn. In the end, with the decision making help of my wonderful editor Gwen, I decided to present two of the five sweaters included in the book to be worked in the round with steeks. The photo shown here is a steeked sweater from Kristin Knits. (The lovely alternative photo was not used in the book and it is by Kevin Kennefick.) This sweater has steeks at both the neckline and the armholes. I've taught a lot of knitters how to sew and cut a steek. I think the first thing to remember is that you must have no fear. If you are very timid, practice on an old swatch following the directions below. I promise you it isn't hard - it is mostly your fear of the unknown that is holding you back! Enough of the chit-chat. Let's move on to how you do it. The biggest advantage of including a steek in your knitting is that you will always be knitting in the round. If you have dyslexic tendencies like I do, it is much easier to always see the right side of the knitting and follow a chart always from right to left. I can't be bothered with working colorwork back and forth and I even knit most of my swatches in the round on double pointed needles. Here is a steek at the armhole of the sweater. Note that the steek begins after the fabric has been knit in a regular pattern until the armhole needs to start. Here is a steek done at a neckline. You will notice a little pouch created by the bound-off stitches at the base of the neck. The gentle side neck shaping occurs at either side of the steek. I use my trusty old Bernina sewing machine to stitch my steeks before cutting them. In these photos, I have used white thread. Set the machine to a straight stitch and sew between the stitches on the outside of the steek stitches. I call this "stitching in the ditch" and the machine stitching will actually disappear. Do this on either side of the steek - there will be 1 row of straight sewing machine stitches on either side of the steek. 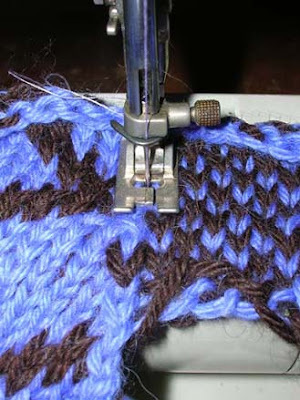 Next, set your machine to a medium zig-zag stitch. My steek has 6 stitches in it. I am going to sew down the center of the two centermost stitches in the steek, making 2 rows of zig-zag. 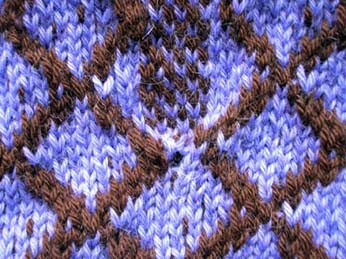 Locate stitch number 3 and sew a row of machine stitches over the the knit stitches. 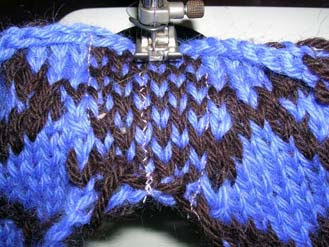 Next, locate stitch number 4 and sew a row of machine stitches over the knit stitches. The photo below shows the second row of zig-zag being stitched. It is important to keep the knit fabric flat and neat while stitching. Do not pull on it as you sew or it will distort and ripple. Make sure you block and steam your knitting before doing the sewing machine work. 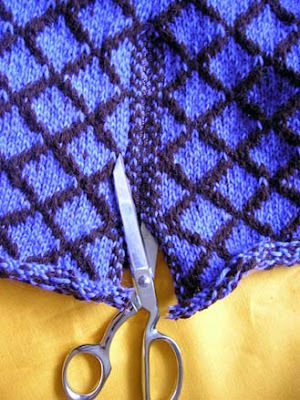 Now, take a deep breath and using a sharp pair of scissors, cut through the center of the two zig-zag rows of stitching. Be careful not to snip the sewing machine stitches (although nothing much will probably happen if you do). 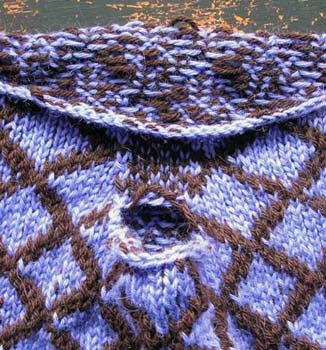 Be careful when you come to the end of the armhole steek so you don't inadvertedly clip the main part of your sweater. The following photo shows an armhole steek being cut. That's all there is to it. Give it a try and see what you think. I have never had a steek fall apart and almost every sweater I have made has used steeks. This series of photos was taken as a guide for the illustrations I did on Cutting a Steek in my new book Kristin Knits. I give full instruction in that book but as someone said, a picture is worth a thousand words. If all else fails and you are still too timid to try, I suggest printing out this blog post and taking it to a local tailor or alterations expert along with your almost finished sweater. They will be able to do this for you quickly and easily and then you can get on with sewing the sleeves in and attaching the neckband and cardigan band. Kristin, I have several books about Fair Isle but have balked at trying it because I didn't want to work back and fortha and I was leary about working steeks. It looks and sounds so easy as you describe it in this post. I may now pick up the nerve to give it a try. There is a Fair Isle Study Group that meets after hours at a yarn shop not to far from my home, so I think I will choose a hat or some mittens and attempt it. By the way, I love Kristin Knits. I'm a beginner, but have knit several things in the round and love it! A question - does using a steek just allow you to knit in the round, or does it also allow a better 'set in' sleeve than so many patterns? Love your site, and just happened to buy your my daughter your latest book as well. Such a surprise when I finally realized you were all the same person! Steeks are something I've never done. You make it seem easy. I'll have to try them sometime soon. I am getting ready to start this sweater next week with 2 friends- I just love everything in the book but decided to start with this sweater. I have steeked 2 times before(Philosophers Wool) patterns but have never been happy with the neckline- I can't wait to get this one going. I mentioned to Molli @Stitches and Scones in Westfield IN that we should have you and Julia come for a visit. 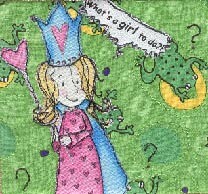 She is expanding and opening Crafty Capers- fiber arts for youth - next door to our great store. We have several teenagers and college age kids that currently work in the shop and she wanted them to have their own place to hang out- knit and do all the weaving and spinning that we do- we will also be doing parties and teaching. So much better than Build a Bear!!! If you would be interested let me know and I will have her contact you. What a really great tutorial..... thank you for posting it! As a sewer as well I know they should not instill such fear in me but they do. I have not taken on a steek in so many years that it now seems untried. You give me courage! Excellent tutorial. I'll refer back to it when I try this technique for the first time. On another note, I ordered a batch of Julia yarn last week. Am anxiously awaiting its arrival to try it out. Thanks for this -- it's very timely for me as I'm about to finally start on my January sweater from EZ's Knitter's Almanac and am determined to try this technique for the first time. There's a group at ravelry for people working on projects from the almanac so I'll let them know about this too. I always like steeking but sometimes have trouble explaining it well to timid friends. Your writing here is clear and I will send them to this entry before we cut into their knits. Thanks for the great job explaining steeking. The only thing I did differently was when sewing the straight seams for an armhole, I would do it all in one seam, like a U: down one side, stop with needle in fabric, turn, stitch across, stop with needle down, turn and stitch back to the top edge on the other side. That way I felt confident that it wouldn't unravel at the lower end. I have a question here. Some time ago I was going to machine sew buttonholes in a little Mason-Dixon knitted bib. I had grosgrain ribbon behind the knitting and the knitting on the top next to the presser foot. The knitting drug horribly and made a terrible mess. My mother used to knit and always machined her buttonholes on sweaters with the ribbon behind. What adjustments should I make to have this work properly? I'm simply too scared to steek! Would love to steek, but i dont own a sewing machine and I really dont sew. Do u need a sewing machine??? I couldn't wait- I have cast on for this sweater- I love the yarn, it feels just wonderful- it's a dream. I am ready to start the diamond panes today- I'm staying in my flannel pants, watching movies and knitting on my vacation day yeah!! Thanks for the info. I've had Little Majolica set aside for knitting one of these days and figured I would convert it to the round. I have always wondered why there isn't more "in the round" work out there. Your explanation makes sense. Question for you. I've heard that with steeks you shouldn't do the color change in the steek, but it seems like such a good place given that the ends are then secured when you do your machine stitching. What are your thoughts? First comment. I just recently discovered your blog. I love colourwork but HATE purling back 'two-handed'. Steeks are the only way to go. A little machine stitching first, and that cut knitting will NOT unravel. Magic! Also, I resoundingly second tonia's suggestion that you come to visit Stitches'n'Scones/Crafty Capers in Westfield IN. That's currently my LYS, too! Molli and the gang are wonderful. I was delighted to read your comment about those Cashen girls! I know Robin will enjoy reading your comments as well. We sure did have lots of fun sewing didn't we. It was especially wonderful to have your mothers expert help in those challenging projects we took on. Thanks for the tutorial! I've decided to steek the shoulder of a baby sweater and add buttons to make the neck bigger rather than take apart the sweater to the shoulder and re-do parts. Thanks to your tutorial, I'm not spending more time figuring out how to steek than it would have taken me to redo the sweater :D Plus, I think this method will add some "personality" to my sweater. Thank you so much! that's a nice tutorial, but I was expecting about Greenhouses http://www.growhouse-greenhouses.co.uk/greenhouses.php What a great article this is, pretty interesting and learned a lot from it! Will be recommending the site to friends and Colleagues. Thank you so much for your help with steeks! You were a lifesaver, very helpful pics.